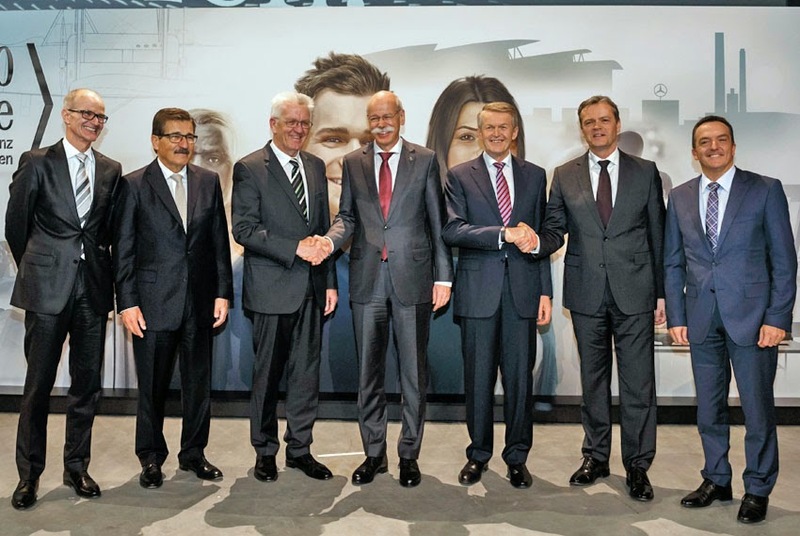 Michael Brecht, Chairman of the General Works Council of Daimler AG was invited to the event along with around 700 representatives of the political and business communities and company employees. "Sindelfingen stands for the origins and the future of the automobile like virtually no other city," said Dr. Dieter Zetsche, Chairman of the Board of Management at Daimler AG and Head of Mercedes-Benz Cars. "Investments of billions of euros emphasize the fact that here in Sindelfingen we aim to be at least as successful in the coming 100 years as we have been over the past century. Another milestone fits in with this picture: this year will see us produce our 20-millionth passenger car in Sindelfingen. But the significance of this location is greater than this figure alone may suggest: Group Research and Mercedes-Benz Cars Development and Design are located here - the nucleus for pioneering technologies culminating in autonomous driving." Winfried Kretschmann added, "As a think tank and centre of competence, the Sindelfingen plant sets benchmarks in technology and innovation. This is where people make the future happen. As demonstrated by my new official car, for example. With CO2 emissions of 65 g per km, the S-class 500 Plug-in Hybrid which is produced in Sindelfingen is driving sustainable mobility in the truest sense of the word. As Prime Minister, I am delighted that Daimler AG is undertaking substantial investments as a demonstration of its commitment to the location in Sindelfingen, the region's biggest employer, and to its future."